Crystal Gorge by David Eddings. 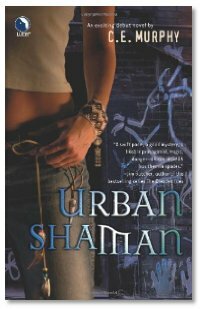 Urban Shaman by C. E. Murphy. Next up is C. E. Murphy, telling us about Urban Shaman. A book that Summer read and enjoyed. The Library segment is back with a vengeance. Lots of titles came into the studio this week. Sorry Evo but you are incorrect! Stephen King did not use the penname Richard Bachman to cover his early career, he used the name Richard Bachman because in his early career the publishing business felt that one book a year was all the public would want. He started publishing under the alias so that he could publish 2 books a year. People eventually caught on and the publishing business realized more than one book was a-okay. Great to hear you had David Eddings on, I only got it this morning, and haven't heard the second half yet. One tip for anyone thinking of reading the Mallorean, make sure you read the Belgariad first, because the Mallorean is the sequel to the Belgariad. Both are excellant series's, the Belgariad was 5 books originally, all with chess names, (Pawn of Prophecy, Queen of Sorcery, etc..). Now you've listened to me and had D. Eddings on, maybe it's time to get Robert Jordan back as his latest time killer... I mean book, arrived for me yesterday from Amazon, and looks to weigh in at a good thousand pages or more again! Robert Jordan will be on the show in a couple weeks. Very Interesting "Feed the Dragon" segment this show. I agress with the spirit of your rant that TV shows should not have short seasons and starting and stopping seasons at odd times is annoying. Love the show, but I think the dragon went hungry this week. I hate you guys for making me want to buy so many books when I already have to read so many for school. Really interested in Urban Shaman. Thanks for correcting Evo on the Stephen King info. How can you have a show about books and not know common info on one of the best selling novelists of our time? Granted I am a huge Stephen King nerd. Does anyone else have the rare King bobblehead in a Red Sox uniform. Yes -- I am that big of a King nerd. Also Evo you lost a lot of credibility with me not just over the Stephen King remark but seemed to have no idea that Land of the Dead was out like months before this "special release" thing. Even Summer missed that (come on girl!). And why acting like a big jerk with Michael this week on the show too, being like you are a know it all. Dude, relax. Its just a podcast, not Who Wants to be a Millionaire (if I was ever on there scratch Evo being a lifeline). Anyway, you are all doing a great show and mistakes are made, but the whole attitude with Michael really bothered me, thus the notes on your errors. At least he has some books out. Not sure on your end, you only hinted at using a pseudonym. Any chance of this audio being republished? I can't find the mp3 anywhere. As far as I can tell, this podcast may be the only recorded interview David Eddings ever gave. Really? If true, that rather astounds me. I'll see what I can do. I've been searching for this interview. It's no longer available anywhere online. I'd really appreciate it if it's made available again. Summer, have you been able to dig out that recording? I'd love to hear David Eddings in his own voice. Richard, I had tried sending you an email directly, but the ones you left here aren't valid addresses, so there was no way for me to contact you about this. Now, because of financial reasons, I need to pull all of the old shows offline, and since there doesn't seem to be any interest for people to be able to purchase old episodes, either by subscription or by single episodes, I'm just going through and making sure that all the barn doors are locked, closing up the shop once and for all.